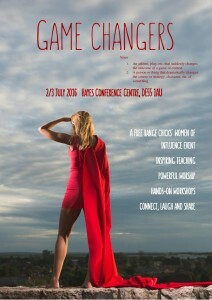 Due to much wider interest GAME CHANGERS is now also open to women of ANY age – not just 18-30’s! Many women have expressed an interest in making a difference so we are incorporating our Women of Influence retreat with GAME CHANGERS! The wonderful PEARL MOSES will now be leading one of the streams of the weekend – ‘Deeper’. Held on 2nd-3rd July, the weekend will include main morning sessions, with our keynote speaker HELLIE BRUNT, practical workshops in the separate streams – including guest speaker MICHELLE JOHNSON, author of ‘Do Great Exploits’, a Q and A session, inspiring stories and of course time to worship, reflect, share and receive prayer – as well as relax and enjoy yourself. The cost is £108 – or £98 if you take advantage of our early bird offer, extended to April 30th. This includes a choice of single or twin accommodation and all meals and refreshments including afternoon tea and Sunday lunch. The Hayes Christian Conference Centre is centrally located in South Derbyshire, close to the M1. Set in beautiful grounds, including areas set aside for prayer and meditation it also has an indoor games room and plenty of space to relax and enjoy a coffee. PLACES ARE LIMITED THOUGH, SO BOOK NOW TO SECURE YOUR PLACE!